After Microsoft killed Kin, stories swirled attributing its mismanagement to warring fiefdoms inside the company. A WSJ report suggests that a similar conflict curbed an effort to overhaul privacy in IE8, with ad sales winning out over the browser group. Consider it another example of the dangers of having the same company that makes your web browser sell the ads you view inside of it. 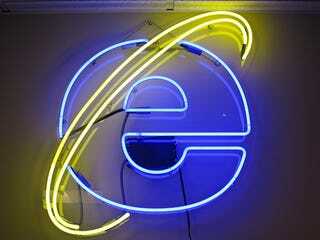 The WSJ reports that in 2008, before the release of Internet Explorer 8, Microsoft's browser team intended to include a feature that would block third-party trackers—the snippets of code that collect personal, anonymous information (catnip for advertisers) that populate websites by the dozens. What was especially radical was that the feature would be turned on by default, automatically giving users a much tighter hold on their personal information and browsing habits than offered by previous versions of the browser, or any competing browser. But that idea didn't sit well with Brian McAndrews, a Microsoft senior VP who had previously been CEO of aQuantive, a web advertising company Microsoft had acquired for $6 billion just a year before, in 2007. He was worried that the proposed feature would cause a "stampede" away from tracking technologies, making it harder for the company to sell ads online. The browser team held their ground, and one executive said of the ensuing debate that he had never seen an internal conflict "so driven by external influences and conflicting priorities to protect users."